Mold is a serious problem that has to be addressed in the beginning stages itself. Otherwise, it can escalate into a bigger problem, causing structural damage too in some cases. Apart from the physical damage that they cause to a building, either homes or commercial buildings such as offices and schools, molds also cause allergic reactions and cause health problems such as respiratory illnesses. Therefore, it is advisable to consult a household mold remediation specialist, at the earliest to assess the situation and then finalize the further course of action. There are different types of molds. All molds are not the same, and nor is the clean-up process similar. There are many species of molds, which are basically fungi. They are found both indoors as well as outdoors. They are found to grow in moist, humid and damp conditions. They reproduce rapidly, producing spores. These mold spores are not visible to the naked eye. But they deteriorate the quality of air. They can also survive in harsh environmental conditions. Cladosporium is a common type of mold that can grow in both warm and cold conditions. It is often seen on fabrics, carpets, upholsteries etc. It is a brown colored mold that has a suede like texture. It can be seen even in the insides of the cupboards. This mold is known to cause allergic reactions as well as skin rashes, asthma, lung infections and sinusitis. This type of mold is allergenic and can occur in many colors. Depending on the environment that it grows, it can be toxic. This is commonly found in the air conditioning systems and on foods. This can cause asthma attacks, respiratory illnesses, and other lung infections. Also called as the black mold, this is a toxigenic type of mold that can cause severe allergic reactions. This mold type grows extensively on cellulose based material such as wicker, cardboard, paper, wood etc. Areas with high humidity levels which are damp and wet are very conducive for the growth of these types of molds. It also has a musty odor and inhaling the mold spores is quite common, which causes many serious health issues. Generally found in damp spaces like leaky pipes, under sinks, showers etc., this type of mold spreads easily. It can also be found outdoors. Children and elderly people are at a greater risk of developing health issues due to this mold. Mold removal can be undertaken by the individuals of the house from time to time. 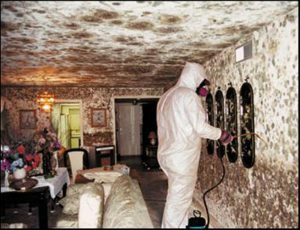 But if the problem is bigger, it is better to consult a home mold remediation specialist, who will give a long-term solution. There are times when the extent of damage done by the leaky pipes is enormous. In situations like these, the problem should be addressed on priority as molds can cause structural damage. Cleaning and scrubbing the area. Getting rid of affected material. 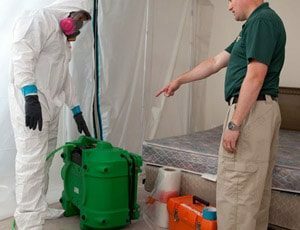 Household mold removal should be a cyclical process and one should always be vigilant so that home mold remediation is conducted in a timely manner.